2016 was a fantastic year for new music, especially for up and coming artists that are finally breaking through the noise that is the music industry. I am really looking forward to seeing debut albums from a few artists below (Dua Lipa, MUNA), and I think that 2017 is going to bring even more amazing new music. Check out my list below of some of my favorite new artists that are going big places in the new year. Declan Mckenna – I need to start this little blurb by stating that Declan is only SEVENTEEN YEARS OLD. I don’t remember what I was doing when I was 17 but I definitely wasn’t already touring the world and planning the release of my debut album. Mckenna won Glastonbury Festival’s Emerging Talent Competition in 2015, and his self-releasing (yes, you read it correctly) single “Brazil” on Bandcamp, which was received very well in Europe. The song was controversial for its message about the 2014 Fifa World Cup being awarded to Brazil while simultaneously ignoring the extensive poverty issues that were piercing the nation. In this article by DIY, a British publication, Mckenna says, “It’s politics and what I see in the news, and it’s just general things I feel strongly about, things happening in my life” when asked about the meaning behind the song. “Brazil” gathered worldwide attention for its message. Listen to the song here. Mckenna just finished up a gig opening up for The Head and The Heart on their US fall tour and his EP was released in May of 2016. I’m not sure when an album is going to be released, but I’m looking forward to where 2017 takes him and I’d love to see him on some North American festival dates. Maggie Rogers – First off, let me just say that Rogers’ debut single “Alaska” is probably my favorite song of 2016. I happened to stumble upon this song in early summer on my Discover Weekly playlist (S/O to Spotify), and I’ve been hearing all over the place every since. Growing up in rural Maryland, Rogers played the banjo and created folk music, but her newer sound was influenced after she studied abroad in France and was inspired by dance music. Two of her other complete albums are on Bandcamp (with 300,000+ streams each), and have gotten her a ton of fans on her social media accounts. A student at NYU’s Tisch School of the Arts, Rogers received immense praise for this song by the one and only Pharrell, who was sitting in on a group workshop where students were sharing their music. He had nothing but great things to say about the song. “I’ve never heard anything that sounds like that. That’s a drug for me,” he said after the song finished playing aloud to the workshop. Watch the conversation here. It’s awesome! Soon after the video was published, Rogers gained a relationship with Mick Management, who is home to artists like Leon Bridges and Real Estate. Her second single, “Dog Years,” was released November 3rd on Spotify. Birdtalker – Talk about all of my folk music dreams coming true. I am so obsessed with this band’s sound and I really hope that they release more music in 2017. Birdtalker is a band from Nashville who was created after husband and wife Zach and Dani Green started writing music together quickly after their wedding. Their sound intrigued a couple of college friends, they started rehearsing a rotation of songs for about a year. Their debut album, Just This, was released in August. Although the band is unsigned, I’m sure that their talent and unique sound will garner some attention in the new year. Anderson .Paak – Most people who know me know that I’m not really all that interested in hip-hop music, but I’ve been hearing this name all over the place and knew I had to check him out. Brandon Paak Anderson has been making music for a few years or so, but changing his pseudonym many times. His first release as Anderson .Paak debuted in January of this year and his album Malibu has been making waves all year long. In 2016, Paak played festivals like Pitchfork, Pemberton, Outsidelands, and Panorama. I’m sure he will have an even heavier schedule in 2017. Watch his performance on the 2016 Soul Train Awards here. Dua Lipa – Again, I’ve been raving about how beautiful and talented this woman is for the past six months. Dua Lipa is barely 21 years old and has been all over the world this past year. With a variety of festival gigs under her belt (I saw her at Lolla and was so impressed with her stage presence and charisma, despite only having one EP released and having to sing a number of unreleased songs to a mostly clueless crowd), and is currently opening up for Troye Sivan on his Blue Neighborhood tour. Self-defined as “dark pop,” her five songs on Spotify have a combined 336 million plays, which is amazing, considering she doesn’t have a full length album out yet. Towards the end of August, NPR published a short documentary about Lupa and her drive to find success in America. check it out here. I believe that as of right now, her album is scheduled to be released on February 10, 2017. I would love to see her on her own headlining tour next year! MUNA – As if I haven’t written about these amazing ladies enough, here I am again! MUNA’s debut album, About U, will be released in 2017, with a North American headlining tour to support the new release. After all three women graduated from University of Southern California, the women had their first headlining show (that sold out, by the way), in Los Angeles to celebrate the release of their EP, Loudspeaker. Throughout 2016, MUNA toured with the likes of Chairlift, BØRNS, Miike Snow and Grouplove, not to mention that the trio played a wide variety of festivals across the country this summer. With the conscious decision of not including gender-based pronouns in any of their songs, MUNA quickly gained a wide array of internet fans in the queer community. These women also use their social media platforms to comment on social issues. Check out these shirts they wore at Lollapalooza. About U will be released on February 3rd, 2017. 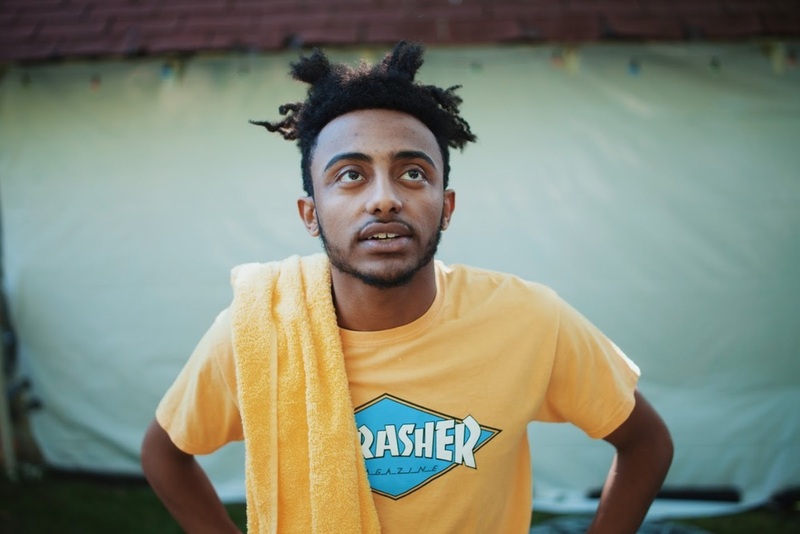 Aminé – I immediately became obsessed with Aminé (real name Adam), after I heard his song “Caroline.” After some research, I found out that he has an entire discography on Soundcloud and that he was signed to Republic Records in early 2016. Only 22 years old, he’s been making waves with “Caroline” after it peaked at number 12 on the Billboard Hot 100. The music video for the song, released in June, already has over 40 million views. Just a couple weeks ago, he performed the song on Jimmy Fallon with a special message in the end of the song, replacing one of the verses. watch it here. All in all, I’m really hoping to see a debut album in 2017 and would love to catch him at a festival this summer. I can see Pitchfork snatching him up. Are there any musicians you’re wanting to see more of in the New Year? Let me know!